By Susan Stern — The social media review giant has one of the strictest terms and conditions on the internet. So, if your in-house marketer or outside public relations consultant is asking customers for Yelp reviews with a link to do so, you’ll want to carefully consider what you’re doing. “It’s clearly unethical when a business offers incentives like a discount or contest entry to write a review. That creates bias, and a conflict of interest. 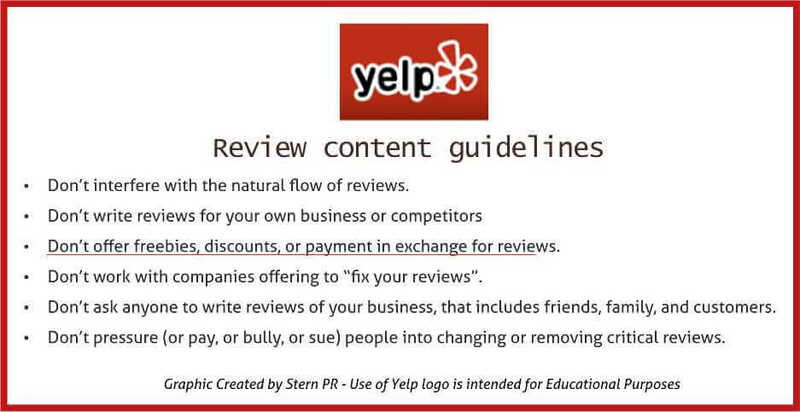 But Yelp’s policy banning asking your customers for online review feedback goes too far,” notes Omaha marketing firm consultant Susan Stern. Without a doubt, a business should never offer cash-for-reviews, discounts or contest entries. Doing so creates bias, a conflict of interest, and is completely unethical. Yet, a quick Google image search found there are many violators. Advertising your business as top-ranked, based on undisclosed-incentive-triggered-reviews, is a major no, no – everywhere! The Federal Trade Commission may file a complaint for alleged deceptive advertising – citing federal law violations. A Georgia auto shipment broker got in trouble for this reason, and for offering discounts-for-reviews without disclosing endorsers received compensation, among other advertising blunders. “On Google, for instance, cash-for-reviews could result in temporary or permanent suspension of your business and maps listing,” said Stern. Therefore, Yelp’s policy that prohibits businesses from giving away freebies, discounts or payment in exchange for reviews – makes perfect sense. Don’t do it. “I think Yelp’s “Don’t Ask Customers for Reviews” ban is ridiculous. From my experience, clients appreciate getting a reminder email, asking them if they’d consider giving feedback. If we rely on so-called “organic reviews” you’ll end up getting fake competitor reviews or reviews by a bad client – you wish you’d never had, creating an inaccurate picture of a company,” added Stern. 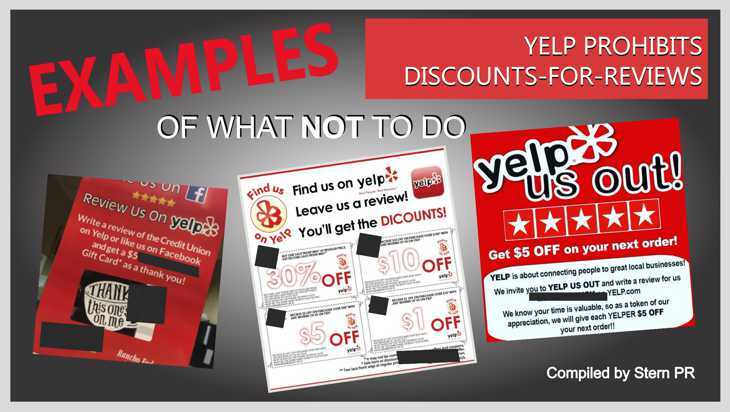 Yelp touts that its automatic filtering software detects reviews that violate its policy. This marketer has found that the algorithm has shortcomings. Should You Follow Yelp’s Review Rules? It’s up to you – to decide whether your business – should OR should not – ask a customer to write a Yelp review for an overall policy that appears to give the upper-hand to bad faith reviewers like a negative Nancy, a never-happy Hal, or an unscrupulous competitor. Keep in mind as you mull over marketing/PR strategy, that an organization’s reputation can be ruined if bad apples are given the ability to deluge a listing with false narratives. For those contemplating a plan to conduct business-as-usual on Yelp, by continuing to ask customers for reviews (in person, by email, via website link, or POS software), the consequences aren’t much. “It doesn’t appear that your Yelp business listing shows up under keywords for search, unless you purchase advertising space. It’s not like Google’s free listing, where a business can rank high organically without buying ads. Google’s not an entity to mess with. TOS violations at Google can suspend or permanently remove a listing, the business, and rank status,” remarked Stern. All of these factors are something to think about.